is 4km north of Downtown Squamish and is approx. 1 km long and 2 blocks wide along Highway99. and is approx. 1.5 km long and 1 km. Squamish, BC is at the tip of Howe Sound, nestled between the world class city of Vancouver and world class ski resort of Whistler. The Coast Mountain range towers above the Pacific Ocean with 6 major rivers flowing in, creating an unprecedented range of outdoor sporting and recreation activities for the nature enthusiast. Squamish has become one of the fastest growing communities in BC, with the laid back lifestyle of a mountain town and quick commute to Vancouver on the newly improved Sea to Sky Highway. The 2016 census shows Squamish now has 19,893 residents - 74% are under the age of 40, with a median age of 38 and average household income of over $88,366. The town itself is approximately 65km to Vancouver (45 min) and 55 km to Whistler (35 min). Development sprawls off the Sea to Sky Highway in a short 11km stretch that runs through town with most commercial development within 1.5 km of the highway. Average daily highway traffic ranges 10-14,000 vehicles and there are excellent commercial transportation options with both CN Rail and a deep sea port servicing the community. There are 4 distinct commercial area highlighted below with product and rental ranges detailed below. The investment fundamentals in Squamish are strong. Residential housing ranges 15-20% less than that of other Lower Mainland suburbs within a similar commuting time with commercial land as high as 25-40% lower. Affordable commercial rents, excellent transportation logistics and a unique lifestyle create an excellent opportunity to relocate and start new businesses. 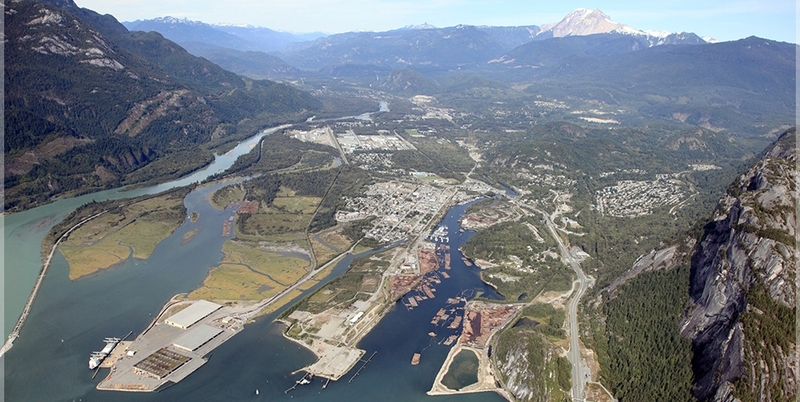 The Squamish Business Park is 1 km north of Downtown Squamish off Highway 99 and is approx. 1.5 km long and 1 km. There is a wide range of light industrial, manufacturing and office users in the primary area off the highway. Most building stock is metal and concrete block with tilt-up concrete buildings in the last several years. The area is serviced by CN Rail on the west, Highway 99 on the east and the port is 3.5 km (5 min) south. There are still a handful of larger parcels of land available. Recent anchor tenants of Home Depot and Walmart in the area have stimulated significant new investment in the Business Park which is quickly becoming the business hub for the Sea to Sky Corridor. Sea to Sky Business Park, a new 20 acre project is in the early stages of development.